This is the first time I've done a UOA on the car. Seemed to check out pretty well; wondering if Blackstone's guidance on extended OCI is rather conservative. 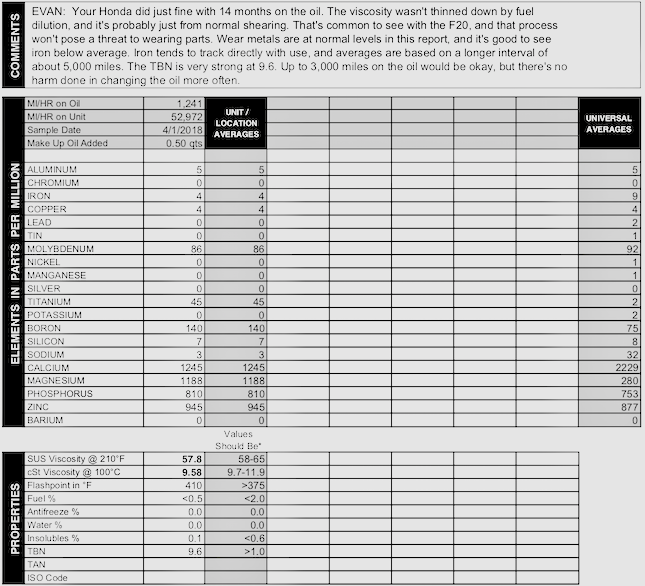 I don't understand how they can say that the UAs (based on 5k miles) with 5ppm are equivilant to 1250 miles at 5ppm ??? No matter; easily can go 5k miles or more. Do you rev this up? It's a little screamer, and that might contribute to the Fe a bit. Last edited by dnewton3; 04/03/18 06:50 PM. Thanks for the feedback. Think it's worth me calling out to Blackstone to correct? I'm assuming everything on my UOA looks good and the averages are off...but please let me know. I certainly do rev it up (after it's fully warmed up, of course). It'd be a waste not to, right? Their 3000 mile OCI recommendation is just based on your current OCI. 5000 is the new 3000!